If you have been looking for a side dish that requires little effort but PACKS in the flavor, look no further. 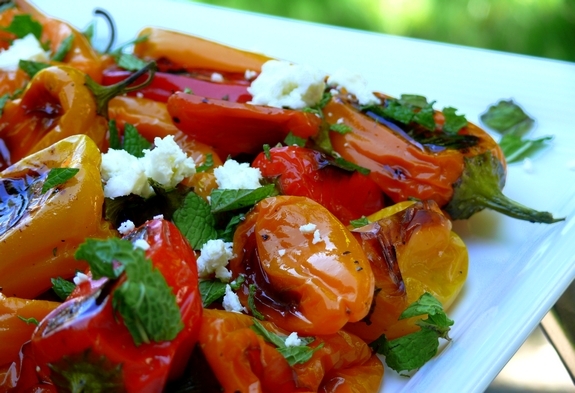 Who knew peppers, mint and feta together are a powerhouse of flavor. Wow. I roast peppers all the time, which are great on their own, but the additions of mint and feta are definitely flavor boosters. We had this with roast chicken and it was fabulous! Don’t worry if mini peppers aren’t available, just quarter regular sized peppers and you are good to go. 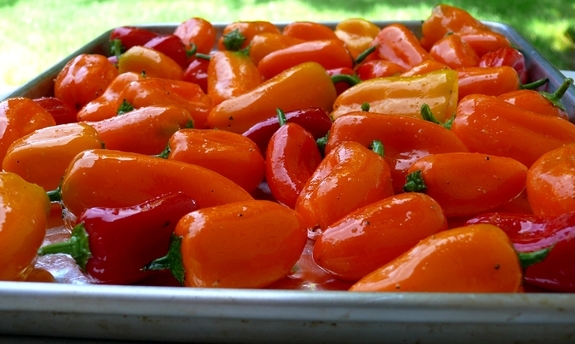 Preheat oven to 450o F. Toss 2 pounds peppers with oil; season with salt and pepper and place on a baking sheet. Roast peppers about 30-35 minutes or until skins are blistered and slightly blackened. 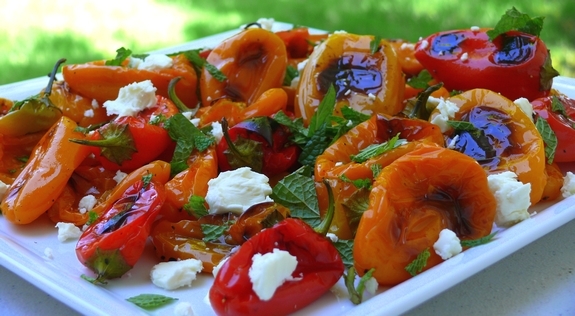 Place peppers on a serving tray and sprinkle with mint and feta. Oh My Gosh look at those striking colours! They look amazing! This looks amazing, I always see these little peppers at the store and don’t know what to with them. Now I do. I love those little peppers. They would be great on crostini too. I never thought of combining peppers and mint, but why not? Last year I grew my own peppers and they all came out too tiny for me to do anything with. Now I have a recipe to try them on when they inevitably come out tiny again this summer! These baby bells do not have seeds.